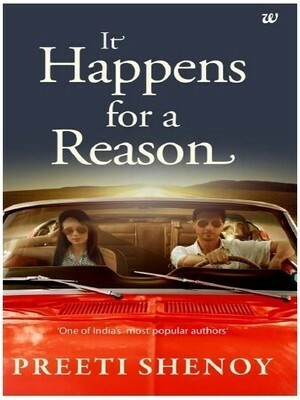 Why you should read ‘It Happens For A Reason’? It’s rare that an author leaves so much of herself in her books- as if chunks of her life and soul in the characters that she creates. When you have followed your favorite author through her blogs, writings, talks and interviews for years, you know what she believes in, what all things she stands for, she raises her voice against, her likes, her dislikes, and her passions. Preeti Shenoy writes about love for dogs- the extremely loyal, infinitely loving canine companions. They may be mute and dumb, but are the ultimate epitome of selfless love. She writes about her craze for fitness and her delight in comfort food. She writes about her relationship with her son and how much she is proud of him through her characters. She talks of her zeal and enthusiasm for gardening, her attachment to plants and her love for greenery. She vents about her obsession with creativity and love for travel and adventure. I totally love her artworks, paper quillings, and portraits. Awaiting a fan moment when I would get an author signed copy of her book and a pic with her. Read the book blurb here. I always find bits of her in her characters. Vee is a single mother running two odd jobs for a living- Paw-Factor, a premier dog boarding facility(a resort for dogs where owners can leave them for safe keeping in case of emergency travel or other priorities) and working a few hours in the morning as a gym instructor. Though odd enough for normal society, she is very passionate about her work. She loves spending time with the different variety of dogs in the house, grooming them, feeding them and playing with them. Jamu Kaka assists her in most of the works- cooking for the dogs and taking utmost care for their well-being. Suchi- Vee’s best friend and soul sister, is one of my favorite characters. Open and free-spirited enough to speak her mind in any situation without sugar-coating the truth; loyal and supporting enough to stand by Vee through every bend and turn in life. Manav is a true friend- one of the important friends who helped shape Vee’s life. Ammu aunty, Suchi’s mother is the epitome of unconditional love and care. Vee had spent most of her summer vacations in their mansion in the middle of a rubber estate- she loved those times, as her own mother in Mumbai had little time for her, busy in her NGOs and social circles. I really liked Vee’s father, though he was literally absent during the first part, he got more involved in his daughter’s life after she was admitted to a convent in Kodaikanal for spending the due course of her pregnancy. Aryan, Vee’s son is the best- mature beyond his years, compassionate and understanding. He is his mother’s best companion for fifteen years. They talk about everything under the sun, have discussions, and share such an awesome friendly rapport. And Ankush- our other lead is charming and has a way with words. He was the one who introduced Vee to modeling in her teenage years and brought her fame at a very early age. The poignancy of parting and meeting again between the leads is the best I have ever read. The language in the book is very simple, apt for a casual reading. The style is simple, narration lucid with some of the best crests and through in plotline that I have come across. The book consists of a total of 256 pages, and you can easily finish it off in hours- but, I’d suggest, you take it slow, feeling all the emotions and sentiments of the characters and registering the extent and depth of their relationships with one another. This is a book that needs to be felt. 1. You love ‘meeting-parting-meeting once again after a huge time lapse’ kind of stories. 2. You love a meaningful romantic tale which is believable with good substance, reality, and practicality in it. 3. You believe that everything happens for a reason, and want to experience it again through fiction. 4. You want to read something where the hero is a single mother. Her struggles through pregnancy, the newborn’s initial days, people who supported her, people who left, people who didn’t care- read about it all, here. 5. A really good book on the longevity of true friendship, those few rare gems that life has bestowed upon us. Time affects it not and neither does years of no real contact. 6. A motivating story about hope, faith, and belief that you never miss out anything in life. Whatever you are meant to experience, you will experience it, in its due time. Everything that happens- every incident happy or sad- happens for a reason. The universe conspires to make something happen; you only know in the long run that a certain series of events that led to havoc in your life were actually leading you to a greater bliss.